From conception to finish, I spent a couple of years on my first novel, Shaken. I had a mentor who coached me, a professor who professionally edited the manuscript, and an internationally acclaimed novelist who provided a critique. But nothing affected my story quite as much as signing with my publisher and beginning work with my editor. Writing is difficult. You are bleeding your emotional artery on the page, complete with life experiences, beliefs, and creativity. But editing? That became another playing field entirely. In my military-romance-driven brain, it could be described as surgery to remove shrapnel. Each piece of metal must be plucked for an individual to get back to full health. In a similar way, editing requires painful digging to remove everything that does not add value to the character. After the shrapnel of your story is removed, you are freed to enhance and improve your story until it’s as close to perfection as you can get it this side of heaven. By the time my first novel went to my editor, the timeline needed major surgery, something I hadn’t thought about in great detail during crafting. I am a pantser and only use a bullet point outline to guide the major points of my scenes. Everything else just spills out on the page. This can make editing much harder for me. When it came time to edit Shadowed, I had a better timeline in place. Lesson learned? Don’t make the same mistakes on the second novel as you did on the first. Ground your character. Ground your scene. Ever heard of floating head syndrome? No? Well, that’s probably because I just made it up. But I have it. Bad. Especially when I am writing in a steady stream of consciousness. Characters speak but you don’t know what they look like or what is going on around them. Thankfully, I am now aware of this ailment and am working to correct it before the manuscript goes to my editor. Each character needs to be firmly grounded in whatever is going on, each person in the scene accounted for, even if only briefly. Your scene also needs to be grounded within the larger story. Your reader should have no question where the character is, what is going on, who the character is with, and what drama is unfolding. Provide concrete details. Paint the canvas. I actually love this part of writing, but I also struggle with fear. What if people think that a place or person doesn’t look that way? What if I get a detail wrong? What if, what if, what if? The “what if” game keeps me paralyzed from simply using my imagination and the beautiful tools of my eyes and the Internet to ground a scene exactly as I see it. I use research to make sure I didn’t get a basic detail wrong, but otherwise, I craft exactly what I want the reader to see. They are less likely to question what I paint in great detail than they are a canvas where I leave glaring holes due to my own people-pleasing and insecurity. No fear. Write boldly. Paint that canvas, and give the readers a scene they don’t have to try to imagine. Let it unfold in all of its beautiful detail. And then make that process even better in the next book. Time for surgery on your manuscript. What weaknesses do you notice that you could improve on next time? What lessons have you learned from your editor (or critique partner)? 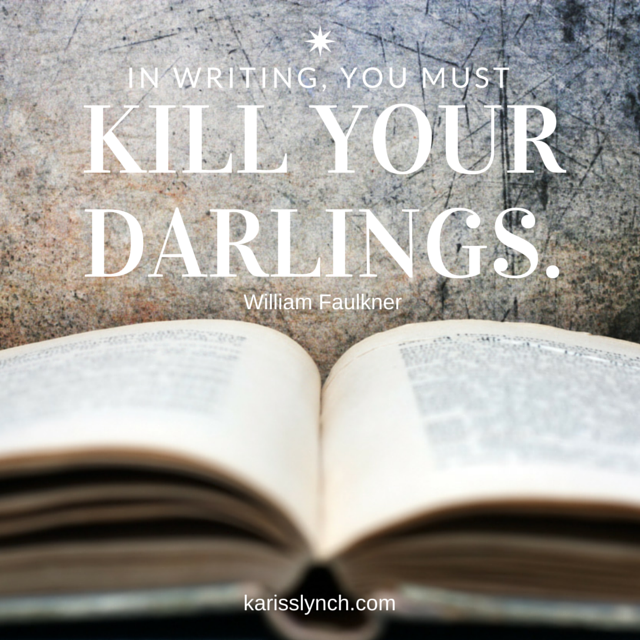 This entry was posted in Editing, Encouragement, Fiction, Publishing, Writer's Life, Writing Craft and tagged editing, fiction, heart of a warrior series, Kariss Lynch, kill your darlings faulkner, learning from an editor, publishing, self-editing, working with an editor, writing, writing advice by Kariss Lynch. Bookmark the permalink. Beautiful post Kariss and you were straight to the point. I have a love/hate relationship with my editor. Once after a scathing critique, I told her to try writing a book before condemning what I’ve written but she completes me. Editors are important to writers as air is to humans. I’ll check out your book… there’s another thing writers ought to do, read, read and read! Thanks for reading! I’m glad I’m not the only one who struggles with the process, but I am so thankful for my editor and how she helps me be better! Great insights into the writing journey. I have an author friend who has been helping me edit my second novel. I appreciate his help so much but sometimes I cringe when I see a message or phone call is from him! Haha I am always terrified to open emails from my editor. Correction is hard! “Writing is difficult. You are bleeding your emotional artery on the page…” I totally agree. Thank you for sharing your heart and wisdom. I work on adding emotion. I have to put on my character’s skin and live what she feels. Once I find the emotion, I visit my Emotion Thesaurus and decide how my character will portray the experience. I’ve learned slowing down for this adds depth to the manuscript.